What are bed bugs? 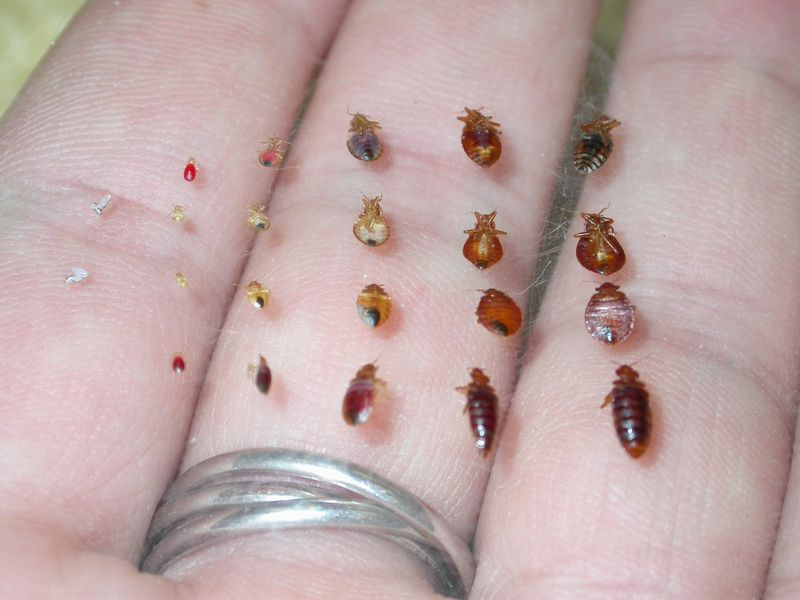 Bed bugs are a household best, they are very small, about the size of an apple seed. The adult bed bugs are flat and oval shaped, this allows them to hide in the tiniest crack and/or crevice. Bed bug eggs are tiny and very hard to see. Bed bugs are found to infest not only homes such as, houses, apartments, townhomes, condominiums, dorms, but also hotels and public spaces. The bed bugs feed on human blood, and are the most active at night when people are sleeping. They are usually found around and under mattresses, box springs, bed frames, night stands and similar areas close to the bed, but can be found anywhere in a room. How do I know if I have bed bugs? Bed bugs are not easy to detect, due to their small size and feeding schedule. Some people have no reaction to bed bug bites; while other may get a small bump or large welt. Other signs may be if one is finding reddish-brown blood stains on bedding, or finding living or dead bed bugs on or near where they sleep such as, mattresses, box springs, bed frames, bedding and furniture. Also, check in cracks and crevices of floor boards, base boards, windows, door frames and electrical outlets. If you do find a bed bug, place it in a Ziploc baggie or plastic container for when the MaxPro technician arrives for the bed bug inspection. I have bed bugs, now what? If it has been determined that yes, I do have bed bugs, now you need to have your home treated. Call MaxPro Pest Control, and we will discuss your options for treatment. If you are a tenant you should contact your landlord right away about the bed bug infestation. Once you have notified your landlord of the situation they should contact MaxPro Pest Control to treat your home. After we are contacted the technician will assess your situation and provide a customized proposal that meets your needs. We will then schedule your treatment at the earliest date available. Is Heat Treatment effective? Bed bugs cannot survive temperatures above 122 degrees F for more than a few minutes, so, if the area to be treated is prepared as directed, and we do our job as professionals, heat treatment will eliminate bed bugs. The heat process is much more efficient and effective than spraying insecticide several times, fumigating, or placing the large items in a trailer and only heating those items. What should I expect? After your treatment is scheduled, the technician will provide you with an outlined procedure in what is needed to prepare the area to be treated to ensure that the treatment is effective. Bed bugs are a serious and challenging pest, so working with MaxPro Pest Control will make for a successful bed bug treatment. Please include brief description of your pest control needs and where you are located.